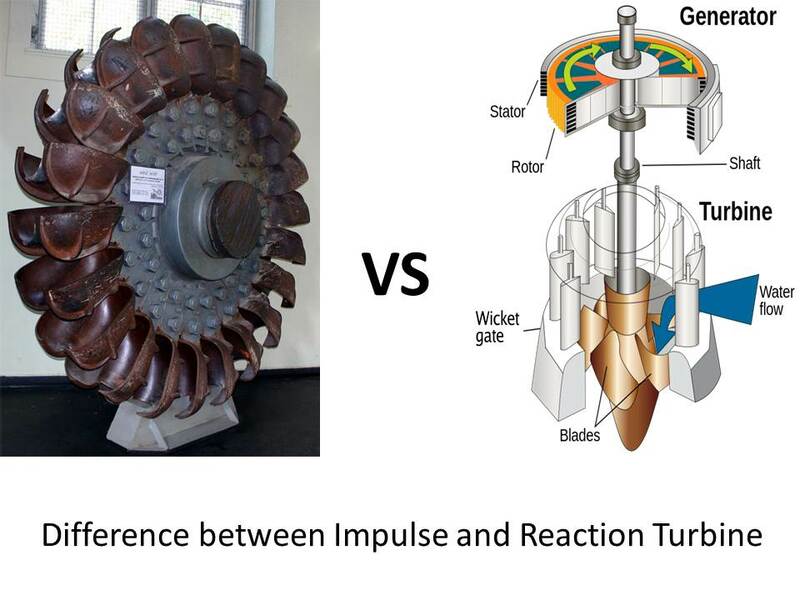 Today we will discuss about main difference between impulse and reaction turbine. In my last post we have learnt about main types of turbine. We know that turbines are widely used in power generation industries. Selection of proper hydraulic turbine is among the most important factor affecting the economic viability of hydraulic project. The term impulse and reaction denote the basic type of turbine. The basic and main difference between impulse and reaction turbine is that there is pressure change in the fluid as it passes through runner of reaction turbine while in impulse turbine there is no pressure change in the runner. In the impulse turbine first all pressure energy of water convert into the kinetic energy through a nozzle and generate a high speed jet of water. This water jet strikes the blade of turbine and rotates it. 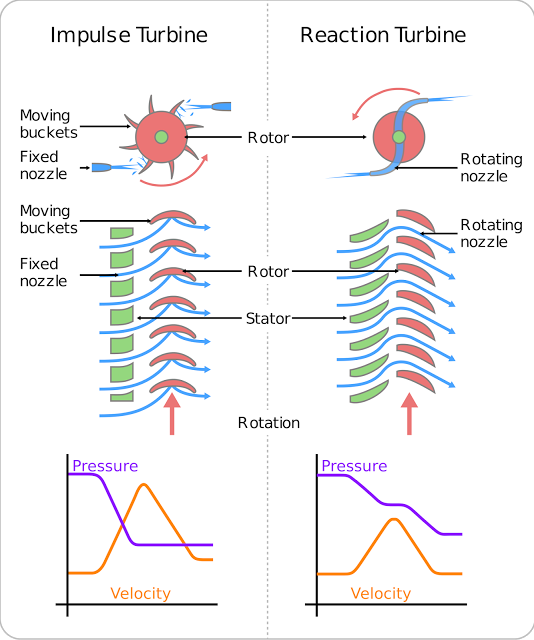 In the reaction turbine there is pressure change of water when it passes through the rotor of turbine. So it uses kinetic energy as well as pressure energy to rotate the turbine. Due to this it is known as reaction turbine. 1. In impulse turbine only kinetic energy is used to rotate the turbine. 1. 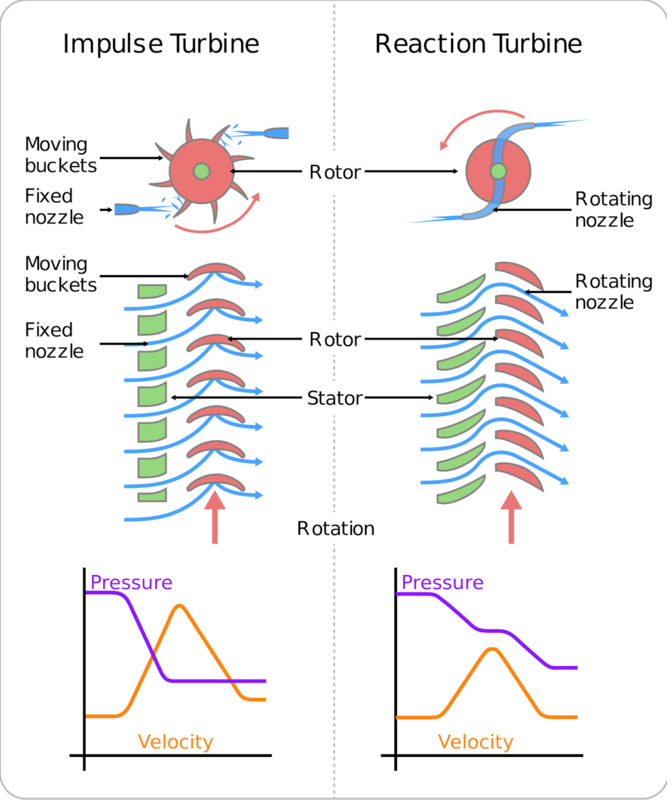 In reaction turbine both kinetic and pressure energy is used to rotate the turbine. 2. In this turbine water flow through the nozzle and strike the blades of turbine. 2. In this turbine water is guided by the guide blades to flow over the turbine. 3. All pressure energy of water converted into kinetic energy before striking the vanes. 3. In reaction turbine, there is no change in pressure energy of water before striking. 4. The pressure of the water remains unchanged and is equal to atmospheric pressure during process. 4. The pressure of water is reducing after passing through vanes. 5. Water may admitted over a part of circumference or over the whole circumference of the wheel of turbine. function to perform because the jet is at atmospheric pressure. This casing serves only to prevent splashing of water. 6. Casing is absolutely necessary because the pressure at inlet of the turbine is much higher than the pressure at outlet. It is sealed from atmospheric pressure. 7. This turbine is most suitable for large head and lower flow rate. Pelton wheel is the example of this turbine. 7. This turbine is best suited for higher flow rate and lower head situation. Today we have discussed about Difference between impulse and reaction turbine. If you have any query kindly ask by commenting. If you like this article, don’t forget to share it on social networks. Subscribe our website for more informative articles. Thanks for reading it. ← What is Turbine? What Are Main Types of Turbines?